Meanwhile, cook mushrooms in butter until golden. Place broiled chops on plank. Make a border of mashed potatoes using two spoons or a pastry tube; brush with butter. Return planked chops to broiler for about 5 minutes to lightly brown the potatoes. 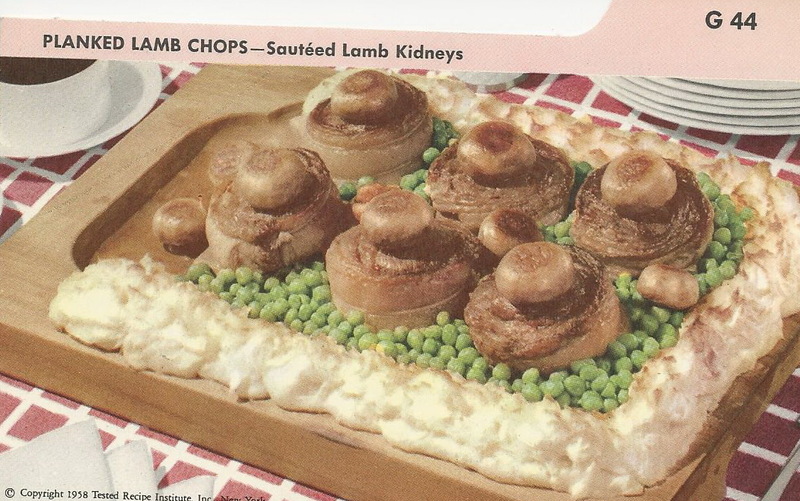 Spoon peas around chops; garnish with mushrooms. Serve at once. Makes 6 servings. Allow 1 to 2 lamb kidneys per serving. Remove outer membrane from kidneys and split kidneys in half. Remove white veins and fat with scissors then, slice, if desired. Sauté in a little melted butter or margarine in a skillet over medium heat, stirring often. Cook just until kidneys lose their pink color. Serve as a main dish with crisp slices of bacon or use as a garnish for roasts or chops.